Pros: Funny, engaging, and well cut, with several standout performances. Cons: This being Shakespeare, audiences must prepare for the long haul, and many dry moments peppered in amongst the humour. It’s not uncommon to have a love/hate relationship with the infamous Bard, and any attempt to tackle Shakespeare, particularly those that lack famous actors to engage the audience despite an onslaught of dated (and beautiful, of course!) language, runs the risk of alienating audiences. 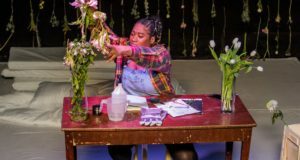 Green Girl’s production adds the challenge of taking on a less familiar comedy, As You Like It, but garners some decent success despite the odds. Fun fact: you may not know that the famous quote/Rush lyric, “all the world’s a stage…” made its debut in As You Like It. Director Mackenzie Thorpe places his production in post-WWII France, exploring the forest of Ardenne after its historical role in the Second World War. I’ll admit that the play’s opening moments did very little for me, and frankly lacked the über-engaging chemistry between cast members I’ve found Shakespeare shows require. 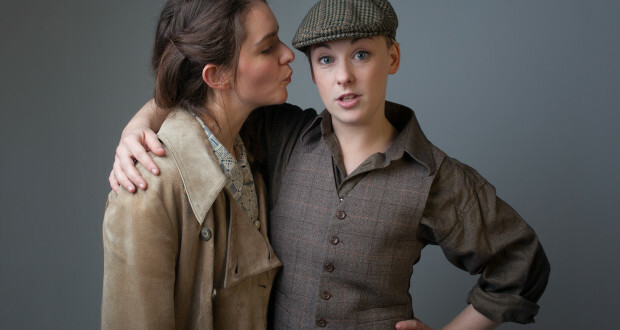 Luckily, Nicola Foxfield’s entrance as Rosalind quickly ups the ante. The actress cultivates a level of chemistry with every player, and easily brings the infamously wordy sequences of Shakespeare down to earth. Things only get better as Rosalind is banished from sanctuary by her uncle, and decides to take up a man’s identity to seek out her father, exiled in the forest. Foxfield makes the transition brilliantly, with a natural sense of humour, and really takes advantage of the fun and freedom provided by Rosalind’s disguise. She is supported by several other shining players, most notably Robert Pearce, who impresses with energy, versatility and a command of the language. As You Like It follows a similar brand of comedy as another, perhaps more familiar play, Twelfth Night. In the forest, Rosalind meets her beloved, Orlando, while she is disguised as a man, and gender confusion hilarity ensues, with Foxfield and Nick Farr (Orlando), building a genuinely endearing repertoire that gives audiences a real reason to root for their romance. Of course you can’t dress a woman up like a man in Shakespeare without submitting some poor, confused girl to fall in love with the imposter. In Rosalind’s case, she unwittingly wins the love of the waspish Phoebe (Emma Johnston), who spurns the love-struck Silvius (Callum King). Johnston and King’s performances offer another example of excellently engaging chemistry, and cemented my hunch that the play was much better whenever the women were on stage. Frankly, the scenes among men, like the lackluster prologue I mentioned, were the only ones that dragged, but as soon as Phoebe and Rosalind in particular entered, the quality of the entire cast spiked. 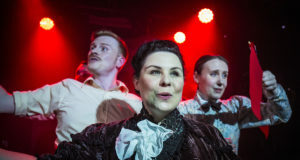 The show is worth seeing for Foxfield and Johnston’s shining moments alone, and rightly so, as Rosalind might be the feistiest of all of Shakespeare’s female leads, and deserves a performer to steal the show as much as the character steals the script. The small and intimate Barons Court Theatre space is ideal for the show, which was cut well, despite a few moments that lagged a little, to a very manageable two hours with a brief intermission. Thorpe’s set is relatively unfurnished to allow for plenty of acting space to accommodate the physical comedy of the script, but the pastoral hues of the costume wardrobe created an excellent aesthetic. 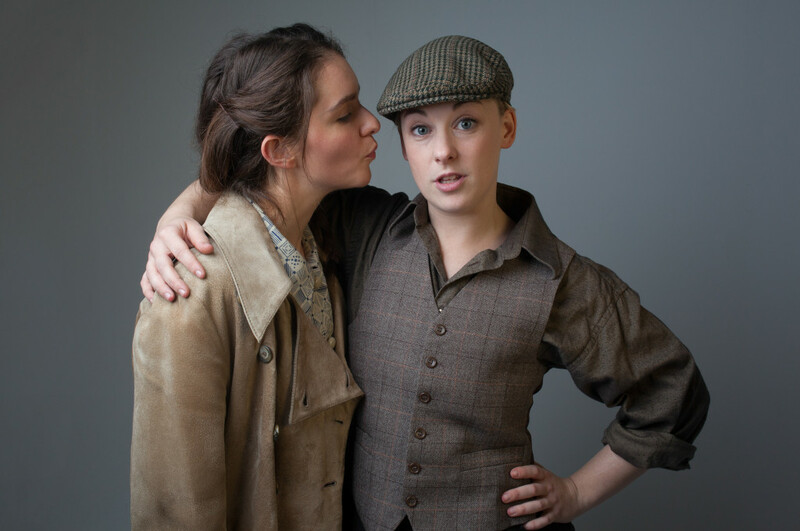 All in all, Green Girl Productions’ As You Like It was undoubtedly a solid staging of a truly funny and refreshing Shakespearian text, and if you have yet to see a production of it staged, The Barons Court Theatre is a good place to start this month! Next: The Factory: changing the rules of theatre?